Before you put that next quarter into a laundry machine, parking meter or tip for your cup of coffee flip it over. Make sure you do not see Frederick Douglas. Released in April, 2017, Frederick Douglass National Historic Site Quarter mark the thirty-seventh coin out of 56 new issues appearing under the America The Beautiful program which started in 2010 and runs through 2021. If you see a coin with a” S” those are PROOF coins minted in San Francisco and should not be in your circulating coins but some have been known to slip in. As you know Frederick Douglas was an outstanding and influential abolitionist who in his early years was actually a slave before escaping to freedom. Throughout the remainder of his life he promoted the ideas of equality, not only based on ethnicity, but also for women.. 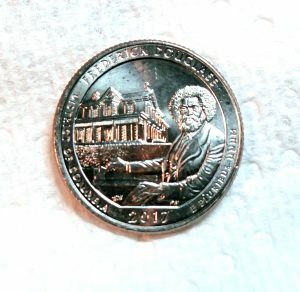 The winning design was by an African-American Printmaker and Engraver, Thomas Hipschen, offers a scene of Frederick Douglass seated at a writing desk, with his home in Washington, D.C., in the background. Enjoy this short video by U.S. Mint Sculptor-Engraver Phebe Hemphill who executed Thomas Hipschen’s the design for use on coins. In the following Mint video, Hemphill talks about sculpting it. This entry was posted in African American Coin Designers, African American Coins, Thomas Hipschen and tagged African American Coins, African Americans on circulating quarters, Frederick Douglas Quarter. Bookmark the permalink.